The fountain is beautiful and the model the sculptor chose for the three nymphs was one of America's great beauties of the day. Madeline Stokes. Our own "Aunt Mandy"! She was a very popular model of the day as she could strike a pose and hold it for a very long time without moving. Born Amanda Straw in Fishing Creek Valley just north of Harrisburg in 1875, she changed her name to Madeline Stokes after moving to Philadelphia and taking to the stage. She was a much sought after model into her late 30s, gracing the cover of numerous magazines. Alexander Caldwell used her as a model for a sundial in Philadelphia's Fairmount Park and her likeness graces a mural in the governor's reception room in Pennsylvania's State Capitol. 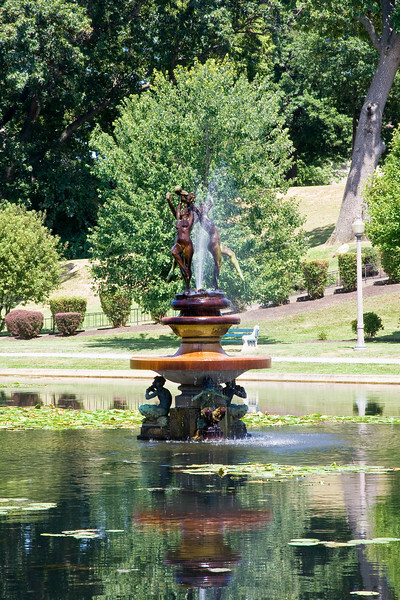 In 1971 the fountain was moved to The Italian Gardens, city park. At the July 16 unveiling at Italian Lake was a special guest, Madeline Stokes herself. Sadly, she died a year later at the age of 99.